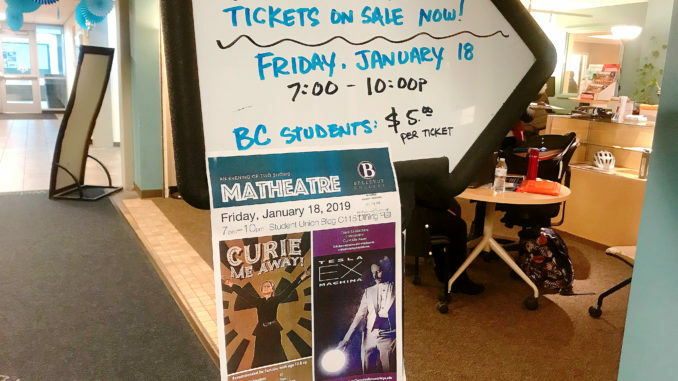 On Friday, Jan. 18, the Chemistry and Physics clubs came together to host Matheatre, a Performing Arts Organization that uses theater to inspire and connect people to the world of science and math. The evenings programming consisted of Tesla Ex Machina and Curie Me Away, two short plays about the lives of Nikolai Tesla, the inventor, and Marie Curie, the Nobel-Prize-winning chemist. During the intermission between the plays, the Physics Club and Chemistry Club put on demonstrations that showcase entertaining and fun ways to use science. Matheatre will be performing two plays for Friday’s event. One of the plays is “Tesla Ex Machina”, which details the struggles of Nikola Tesla’s life after he suffered from partial amnesia. Tesla will have to pull his life back together, each memory a new piece to the shattered puzzle of his mind. The story will mix history, science, and engineering with Coates wearing the shoes of Tesla on stage. There will be demonstrations of several of Tesla’s most important inventions, such as the induction motor, an early robot, and, of course, the Tesla coil. Praise for Coates in the role is high, with a review from the Cincinnati City Beat stating, “Coates wins us over with his intensity and commitment.” “Tesla ex Machina” is certain to entertain any audience. The other play slated for the evening is “Curie Me Away,” a musical about the struggles Marie Curie faced on her road to winning a Nobel Prize, not once, but twice. The play will follow Curie’s life, from her battles fought to gain a higher education, through her work that shaped our understanding of how the universe works. It will also follow her more personal trials of marriage and motherhood. “Curie me Away” was written with the help of a chemistry professor, and it will cover topics including compounds, reactions, periodic groupings and the radioactive half-life. Marie Curie will be played by Sadie Bowman. The Salt Lake City Weekly claims that her “energetic performances provide a solid foundation for conveying the obstacles faced by Curie in the early 20th century as a woman—and eventually wife and mother—trying to be taken seriously as a scientist.” The play’s mix of a strong female lead, chemistry and music is sure to be an enjoyable time. Matheatre’s performance will begin at 7 p.m. and end at 10 p.m. with an intermission full of exciting demonstrations by Bellevue’s Chemistry and Physics clubs. Demonstrations will include making nitrogen ice cream and freezing marshmallows for audience members.